When Allison Miller lost her job as a server at a restaurant that closed last summer, she wasn’t sure how she would make ends meet while living in San Francisco, one of the most expensive cities in the country. Surviving on unemployment benefits, she was able to qualify for CalFresh (aka food stamps), funded through the federal Supplemental Nutrition Assistance Program (SNAP). Though she had limited resources, she wanted to continue to buy her produce at the farmers market, where she had developed strong ties with local farmers. For 47 million Americans, SNAP is vital to putting food on the table. More than 50,000 San Franciscans currently receive benefits, which is only half the number of people that are currently eligible, according to the San Francisco Food Security Task Force. To qualify for SNAP, a single person must have a gross monthly income of $1,211 or less. A household of four must earn less than $2,498. While the USDA recommends that Americans fill half their plate with fruits and vegetables, federal SNAP guidelines do not distinguish between fresh and processed foods. The cheapest but least healthy foods, such as soft drinks, candy, and chips, are often the go-to for low-income shoppers trying to buy enough calories to feed their families. One-third of adults and 17% of children in America are obese, and low-income people are especially vulnerable. But thanks to programs offered at farmers markets around the country—and soon to be offered at the Ferry Plaza Farmers Market—an abundance of fresh fruits and vegetables may become within reach of a lot more low-income families. 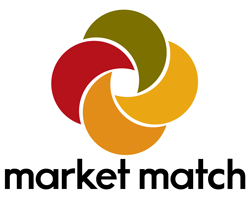 Started by Roots of Change in 2009 and now administered by the Berkeley-based Ecology Center, Market Match is a statewide healthy food incentive program that aims to improve the health of low-income communities by incentivizing shoppers to buy produce at farmers markets. Here’s how it works: A farmers market shopper uses their Electronic Benefits Transfer (EBT) card—the digital form of food stamps—at the info booth and receives tokens to spend in the market. Their tokens are doubled dollar-for-dollar (often with a cap of, say, $10 per market day) with Market Match tokens to purchase fresh fruits and vegetables in the market. By taking out $10 in benefits, a CalFresh shopper now has $20 to spend on healthy food at the farmers market. Many markets also offer incentives for WIC (Women, Infants, and Children), another federal food assistance program. The need for assistance is great, and with additional Farm Bill funding on the way, farmers market nutrition incentive programs are sprouting up around the country. 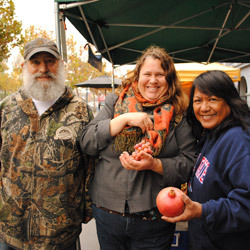 Through Ecology Center, 153 California farmers markets already offer Market Match; this year the program generated 46,412 transactions that served thousands of families and over 1,000 farmers. With the proven success of the program, the Ecology Center plans to expand Market Match to 180 venues in 2015. Next spring CUESA is proud to be launching the program at Ferry Plaza Farmers Market, where CalFresh shoppers already spend more than $10,000 annually. With Market Match, CUESA anticipates that the number of SNAP dollars spent at the market will grow significantly, which is why we have made the program the focus of our year-end fundraising campaign. By raising $20,000 dollars this December, CUESA will be able to create a Market Match fund that will cover the incentives as well as administrative costs of the program. CUESA is also working with the Ecology Center to apply for a federal matching grant that would extend those funds even further over the next two years. Working mother Jennifer Hamlin started shopping at the Ferry Plaza Farmers Market when she became pregnant with her son, Joseph, now nine years old. As a Mary Kay Cosmetics consultant and online student, she says CalFresh benefits have allowed her to purchase fresh produce at the farmers market even when times are difficult. Jennifer believes that getting to know the farmers personally over the last 10 years has been instrumental in raising her son to love fresh fruits and vegetables like raw spinach, which he enjoys without any dressing. 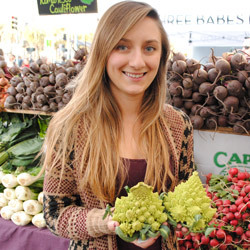 Farmer Janet Brown at Allstar Organics has witnessed the many advantages of Market Match to both shoppers and producers at the Marin Civic Center Farmers Market, where the program is already being offered. “It’s like a stimulus package to local agriculture, since the money can only be redeemed at farmers markets,” she says. “If someone takes out $10 in food stamps each week, that’s $20 they’ve committed to spending at the farmers market. That’s a big deal for everyone.” In 2013, Market Match generated $1.4 million in sales for California fruit and vegetable growers, and the Ecology Center projects $1.6 million in sales for 2014. Equally important, Market Match introduces new shoppers to farmers markets, where they’re exposed to fresh and whole foods, the building blocks of a healthy diet. In California where at least 1.8 million households receive CalFresh benefits and nearly two-thirds of all children born are served by WIC, such exposure could be game-changing for a generation at risk for obesity, diabetes, and heart disease. Help CUESA offer Market Match at the Ferry Plaza Farmers Market.